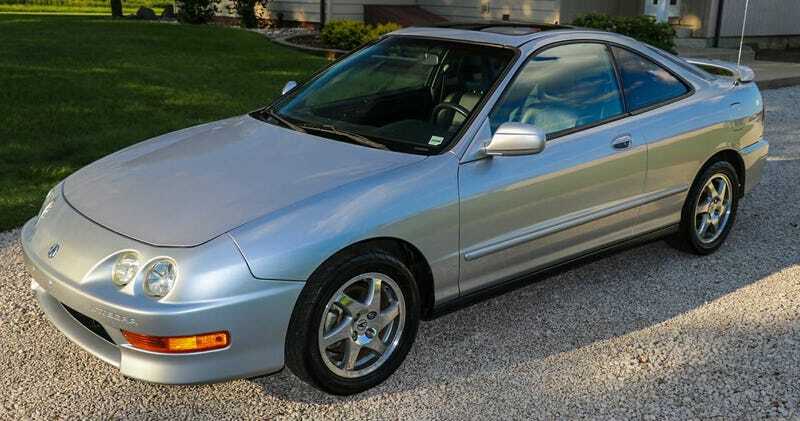 At $7,250, Could This 2001 Acura Integra GSR Be Priced Accurately? Car makers love giving their wares nothing names that still sound important. Today’s Nice Price or Crack Pipe Integra is a prime example. Let’s see if its meaningless name can overcome a meaningful drain on your bank account. Okay look, I’m going to lay upon you some sage advice—if you’re going to be selling a limited production series-produced model, it damn well better come with all the parts that made it unique intact, AND the plaque that identifies both its provenance and its series number. The seller of last Friday’s 2008 Ford Funkmaster Flex Expedition failed to abide by that simple counsel, offering the truck with an incorrect grille and bumper, and missing its series numbered and signed console plaque. Those factors—along with the fact that its was a Funkmaster Flex Expedition—went a long way in dissing the truck’s $8,500 asking. In the end, it fell in a 70 percent Crack Pipe loss. So, as I noted, a lot of cars out there have made up names. Acura was once supremely guilty of this, and in fact even the brand’s name follows that practice of engendering an impression based on a made up word. What is Acura? Is it accurate? A cure for what ail’s ya? A curiosity? Delving into the company’s early model lines only clouds the question further, as both Viggor and Integra featured made up names,e similarly intended to imply a certain positive attribute. With such funny names, it’s a good thing the cars that carried them were pretty darn good. Here we have one of those good models, a 2001 Acura Integra GSR. The Integra name was applied over the course of three series and a little over a decade and a half’s worth of production. It was superseded by the RSX in U.S. in 2001, the model name of which aligned with Acura’s then new alphabetic model naming convention. It was still an Integra in everything but that name. This model directly preceded the RSX and hence makes it one of the last of the Integras. It’s also a GSR model, which indicates that it rocks the 170 horsepower B18C1 four. That DOHC, 1,797 cc mill features a VTEC head and trippy 8,000 rpm redline. As you might expect of a rev-happy little four, it’s not a torque monster, and in fact the maximum 128 lb ft of twist is late to the party at 6,200 rpm. A five-speed stick backs up all that “YO,” and the ad claims a new clutch to be in residence in between. This particular GSR comes in metallic silver over black leather and with 161,000 miles on the clock. It’s a two-owner ride, said to be stock except for its stereo and air freshener tree, and to have lived a good bit of its life in hot and dry Arizona. The body is as clean as you could want—at least in the provided pics—and it’s nice to see it riding on its factory alloys and without any aftermarket additions. The seller should be applauded as well for having gone to the trouble of taking some underside shots while the car was up on a lift. That shows a below that’s as dry as Carrie Nation, and that also serves as a testament to the coolness factor of gold anodized fasteners. Sadly, the seller didn’t give us any head shots of the mill to confirm the appearance up there. We do get to see the interior, and it’s just as nice as the outside and underside. A pair of heavily bolstered buckets face a dashboard the harkens back to an era when Honda did dashes right. Compare this one to that on a modern Civic and see which one gets your eye twitching. A clean title ultimately seals the deal on this Integra’s bonafides. The present owner however has not been able to do likewise on its sale. He notes the reason for the sale is to get flush for an intended restoration of his granddad’s Ford Model A, a noble quest if there ever was one. He apparently had the Integra offered at a higher asking, but only received responses noting that his price was too high. Oh Craigslist, don’t ever change! He now has the car listed at $7,250 and says that’s flexible. We’re at the point now where we can help him in determining how flexible he needs to be. Do you think his present price leaves little bending room? Or, is that going to need a new word to describe just how low he’ll need to go? Dayton, OH Craigslist (although the car is in Indiana), or go here if the ad disappears. For $8,500, Does This 2008 Ford Expedition Limited Bring The Funk?